First period, first 5 minutes. You notice that Wheeler's taken Axelsson's spot on the top line. Why mess with a good thing? 3 minutes later, Brad Winchester ties it up for St. Louis. 1-1. The Bruins are looking wicked flat, and I don't like it. And all of a sudden, there are no Mannys in net. Legace probably hurt himself somehow. Second Period, 7 minutes in, and the Bruins are down, thanks to Mr. McClement. That about ends it for the second. Score entering the third: 1-2, St. Louis on top. With less than 5 minutes to go in the 3rd, the score is the same. In your mind, you're going "c'mon, not to the blues. Not to the blues. not to the blues. You can do it, Bruins." 2-2. We can find out what a world without that would look like later, I suppose. Bruins keep the Powerplay, and see the opportunity to turn it all around. They end up in their own zone, and then go rushing in. Wideman leads the charge, and bounces it off of Mason's chest. Ryder flies through the zone, trying to get it but misses. Luckily, P.J. is there. 3-2. Can we stop whining about Axelsson, now? It's not like he hasn't scored clutch goals. 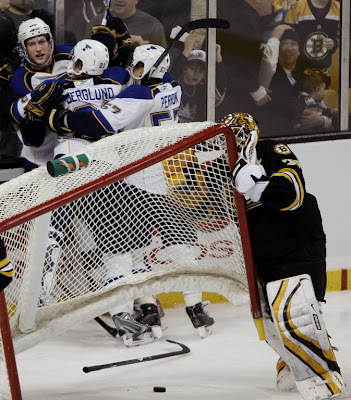 I think people are just reminded of how crappy the bruins used to be just by his presence. Or their scared of his hair. Either way, the Bruins are back on top and the world is wonderful again. 30 seconds after that, and there's a faceoff in the offensive zone (icing, I believe). Krejci steps up to the center dot. He gets it out just enough for Axelsson to get it back to Chara, who lets fly. It gets through 8 players, 3 beer lines, and one St. Louis Blues goalie. Nice screen job, everybody. 4-2. You're thinking, "3 minutes left, just gotta get the empty netter now). 4-3. You're thinking, ok, 1:20 to go, let's just keep it in the offensive zone for the rest of the game, please? Toronto calls it a goal, but the replay we saw at the garden showed the stick never getting below the crossbar. Any time they want to set up special cameras for that, I'm for it. 4-4. 0.8 seconds to go. You're wishing they still served beer, because you could use one right about now. Overtime ends in a tie. The Bruins are out of practice on the shootout. And lose.